On Tuesday the 10Th My Girlfriend and I went fishing at Chaparral park in Scottsdale, We got there around 10 O'clock in the morning and started fishing for Trout since the Game and Fish Department supposedly stock the week before. After a few hours I decided to try a Rattle Trap fish lure, I had cast it out about three times and I thought I might have snagged it but It turns out I had caught a 2 pound Bass. I put it in a live fish basket and put it back in the water, Amanda decided she wanted to try and fish for bass so she used a Rattle trap lure and after a few casts lost it to the lake, She then grabbed a new swim minnow bait we had just bought and started to fish with it. She had cast it out a few times and thought she had snagged it but it turned out to be caught in the mouth of a small Bass about 8 inches long. Here are pictures of The Bass we caught, First one is My 2 pound Bass and then Amanda's 8 Inch Bass. She will not touch the fish that's why she is using a baby wipe to hold it. The next picture's are the lures we used. First is the Swim lure and second is the Rattle Trap. Here are the two Bass in the Live Fish cage. We decided after catching the bass to put up all the fishing equipment except one fish pole each and some lures and walked the lake, I lost my rattle trap and decided to stop fishing and we headed home. 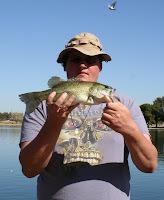 On Sunday the 15Th My Brother Robert and his wife and I went fishing at Chaparral park again and well, Visit his Blog to see what happened that day.